View our range of property in Kalkan for sale right by the beachfront boasting the most amazing views in the Turkish Mediterranean coast. Call PLACE OVERSEAS + 44 (0) 20 8371 0059 for widest range of Kalkan real estate in Kisla, Komurluk, Kalamar.Bays. Kalkan presents the more discerning overseas home buyer with an amazing opportunity to purchase a seafront property at a fraction of the cost they are in comparable Mediterranean destinations. In addition, Kalkan properties command rental returns in excess of 6% per annum, making this idyllic holiday destination a superb investment at the same time. This former fishing village has retained its authentic charm and is still considered one of Turkey’s top hidden spots. Because Kalkan’s around 120 kilometres from Dalaman Airport it does not attract the usual holiday crowd – this may explain why the town has retained its beauty and charm. Home to a community of Turkish artists, intellectuals and writers, the town’s cobbled streets and whitewashed houses attract a Bohemian crowd, who travel here year after year. Kalkan has also become a favourite destination of Brits wanting to escape the hordes of package holiday tourists. Kalkan’s exclusive harbour and proximity to the Greek island of Meis means the town is a favourite stop of sailors, who traverse the beautiful coastal route from Fethiye to arrive in Kalkan's compact harbour. Thanks to the town’s elevation, the majority of properties for sale in Kalkan enjoy stunning sea views over Kalkan and Kalamar Bays. Traditional holiday home hot-spots include Komurluk, Kisla, Kalamar Bay and Ortaalan, which are all within walking distance to the ancient harbour, shops, bars and charming rooftop restaurants. Property prices are higher in Kalkan than other parts of Turkey, thanks to the town’s high-end reputation and limited building space. Kalkan real estate offers a number of elite luxury villas, as well as more modest and affordable seaside homes. 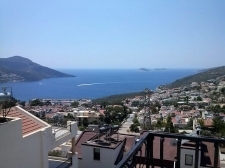 There are also a number of lovely Kalkan apartments and penthouses for sale with panoramic sea views. It’s worth noting that the further you travel from the seaside, the lower prices become.